You’ve set the date for this year’s Christmas party, but the next big conundrum is what theme are you going to choose? How are you ever going to top last year’s Christmas bash? Well, the good news is, YOU CAN! Viva Las Vegas is one of The Show Girls most popular themes. This theme is tried and tested and never fails to please. With something for everyone a Las Vegas themed party is always a winner. 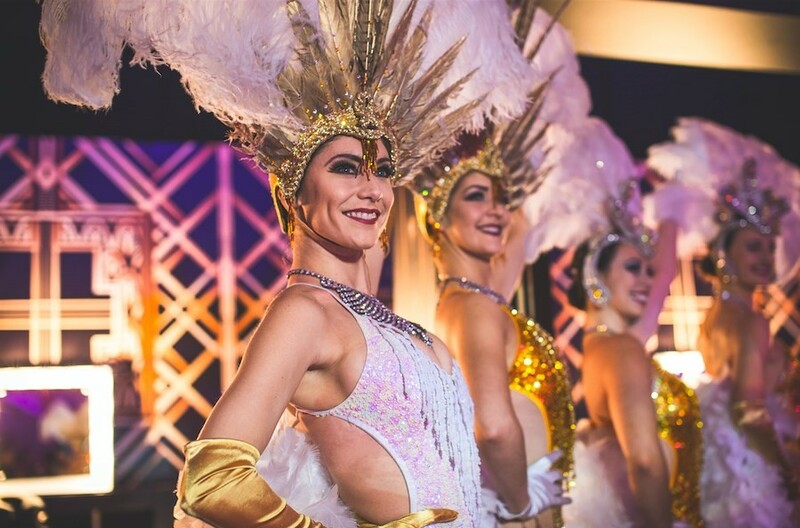 The Show Girls will be on hand to meet and greet your guests on arrival in true Las Vegas style in their dazzling sequins and plumes. 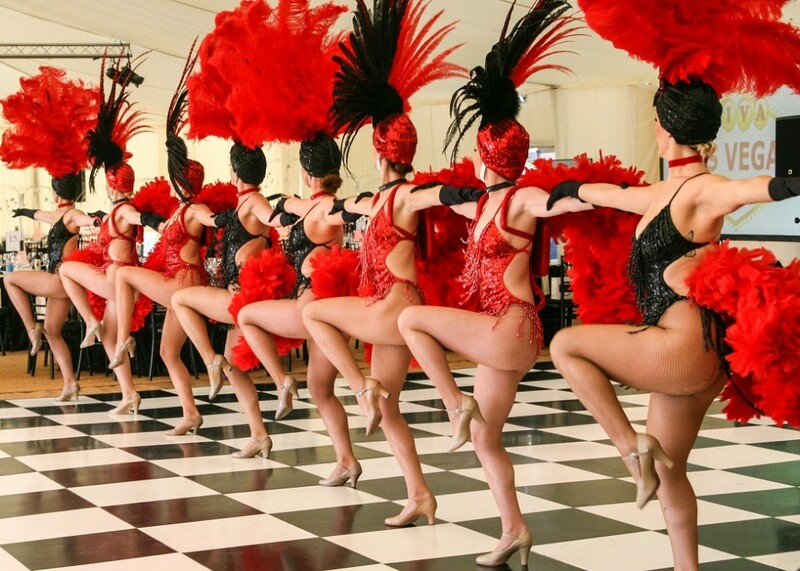 Warble Entertainment are proud to boast that our showgirls have one of the biggest and most luxurious selections of showgirl costumes in the UK. They will even coordinate their costumes with any colour schemes or themes that you have for your event. Posing for photographs with guests and assisting in handing out those all-important welcome drinks makes sure that your guests have the most memorable welcome! Not only do our show girls look stunning but they are also all professionally trained dancers. These leggy ladies will be happy to perform high kicking choreographed dance routines throughout the evening and can even perform along side an Elvis or Rat Pack tribute artiste with costume changes throughout. 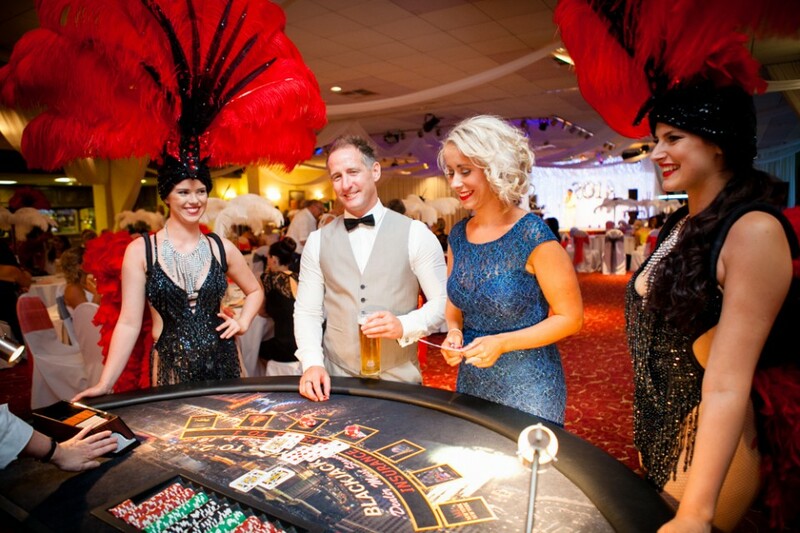 Match that with a selection of fun casino tables, fun photo booths and one of Warble’s fabulous party bands and you will really have a night to remember! Top Tip: Did you know you can also book the handsome Show Boys to work alongside The Show Girls? We have seen a shift in this trend in 2018 moving away from The Great Gatsby and focusing on the new twist to this theme. With the new series of Peaky Blinders hitting our screens in November this is a dead cert to be one of the big Christmas party night themes of 2018. Your 1920’s dancers will be on hand to greet guests on arrival, pose for photographs and assist in handing out welcome drinks on arrival. They may need to take a secret password from your guests to guarantee entry – always a fun way to start the evening! A great way to bring your drinks reception to life is to book one of Warble’s authentic roaming Jazz bands – your fancy flappers will be more than happy to bop along with them encouraging your guests to join in on the way! 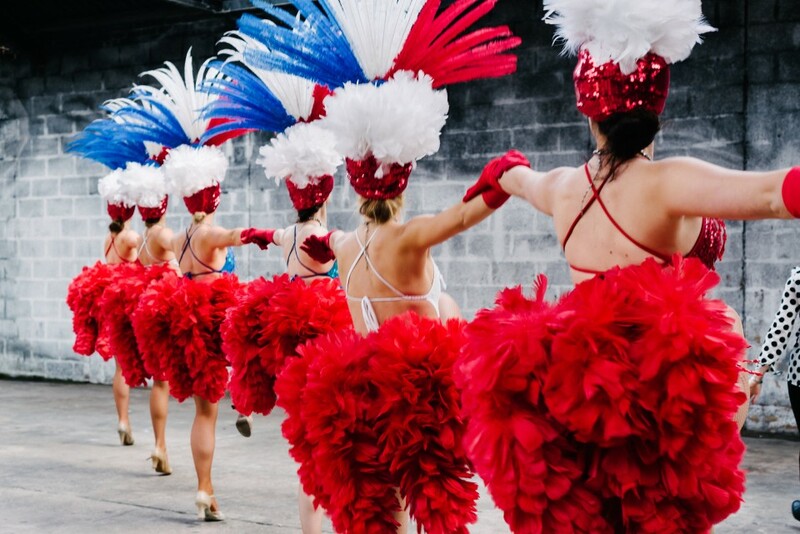 Handing out props to your guests such as feather boas and trilby hats is another fun and interactive way to get your guests involved – it also makes for great photo opportunities with your Charleston dancers. Our Peaky Blinders themed dancers have a selection of authentic 1920’s dance routines that can be performed throughout the evening or performed together to create one longer performance. They can even take to the floor and teach your guests a short, fun Charleston of their very own! Top Tip: Don’t forget that male Peaky Blinders dancers are available to really add that air of authenticity. The box office smash hit of the year that has had everyone singing along has got to be The Greatest Showman. 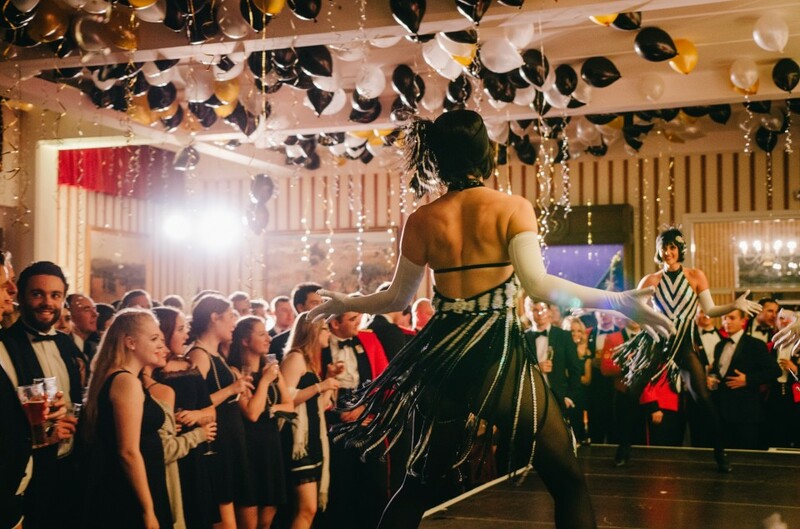 We might not be able to guarantee Hugh Jackman at your party, but the Show Girls can provide a selection of Greatest Showman inspired entertainment to captivate your guests! With our Ringmaster and Cirque style stilt walkers on hand to meet and greet your guests this theme is certainly not short on photo opportunities. Candy floss machines, popcorn girls and a whole host of Cirque themed props and decorations can transform your venue into your very own big top for the night! With a wide range of performers available, you can hand pick the following cast members for your custom-made themed performance. Contortionists, fire performers, stilt walkers, aerial hoop artists and much more. Boasting a completely customisable line up, the beauty of this theme is that it can be scaled up or down to suit all budgets of entertainment. Both smaller ambient entertainment all the way to a full cast production number. Each act also boasts its own feature performance. 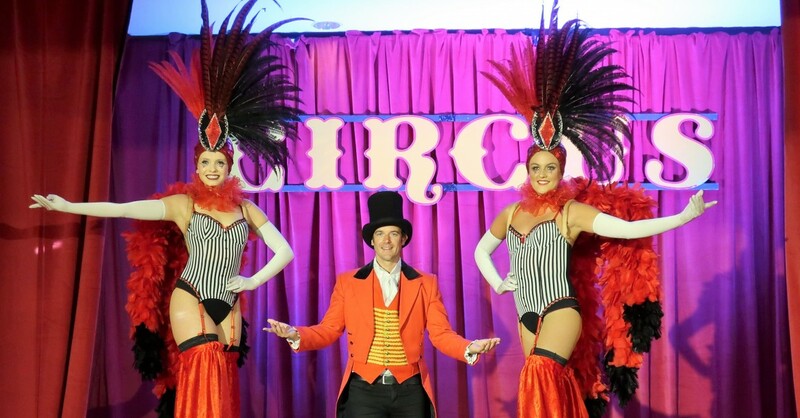 Top Tip: Did you know your ringmaster can also be on hand to host and compere the evening’s entertainment? The Show Girls can work with most budgets, starting from 2 performers right up to 50 dancers for the largest events. With a list of credits that include TV shows such as Big Brother, Dancing On Ice and many more to working with some of the UK’s most prestigious companies at corporate events across the UK, they can bring their vast experience to make any event a success. For more information, get in touch with Warble Entertainment.